Sit back and relax aboard a deluxe air-conditioned washroom-equipped motor coach, as you enjoy the most popular and historical sites of the Niagara region. During the drive to the Niagara region your experienced Niagara Parks licensed guide will educate you on the most exciting highlights Southern Ontario has to offer. By choosing this exclusive package you will leave Niagara as truly, the local expert! Upon arrival in Niagara Falls the first stop is the Whirpool Rapids/Niagara Helicopter. 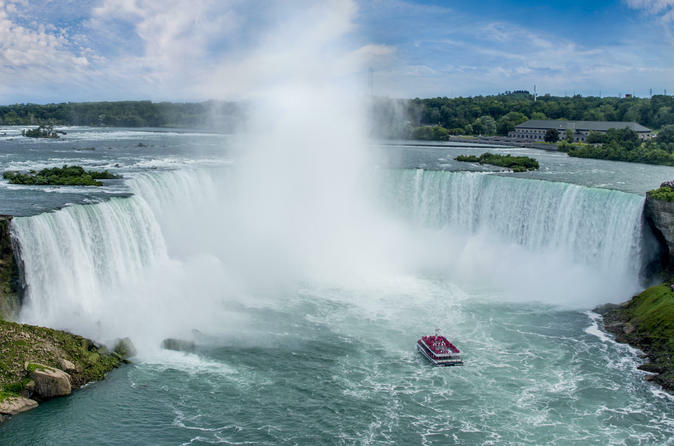 (Helicopter ride optional, additional charge) This will be followed by a much anticipated ride aboard the Hornblower Niagara cruise taking you to the base of the Horseshoe Falls. Here is the thunder of Niagara! You will then be escorted to the Fallsview Dining Room in the Sheraton on the Falls for a well deserved Buffet Lunch, while taking in the breathtaking panoramic views of Niagara Falls. After your relaxing lunch, you will head to the Table Rock Complex to get a closer look at the Horseshoe Falls. Free time is allotted here for additional sightseeing, photo opportunities and souvenir shopping. Our tour will continue along the Niagara Parkway towards Niagara-on-the-Lake. Once in Niagara-on-the-Lake, you will have free time to explore and soak up some of the history and heritage of one of Ontario’s most famous landmarks. And of course, no tour to the Niagara region would be complete without visiting one of the local wineries, where you can sample some of Ontario’s finest wines. Tour aboard a London-Style Double Decker Bus or Trolley. Let our friendly and knowledgeable tour guides educate you on the fun facts and history of Toronto as you cruise through the city with stops at or near all major hotels in the downtown area. Join the tour at any one of our over 20 scheduled stops at featured attractions and points of interest and then hop on and off all day! Your ticket will be valid for two consecutive touring days and also includes a free boat tour of the Toronto Harbour and islands. Special Offer - Book this tour and save 11% compared to booking each tour separately! - Book Now!